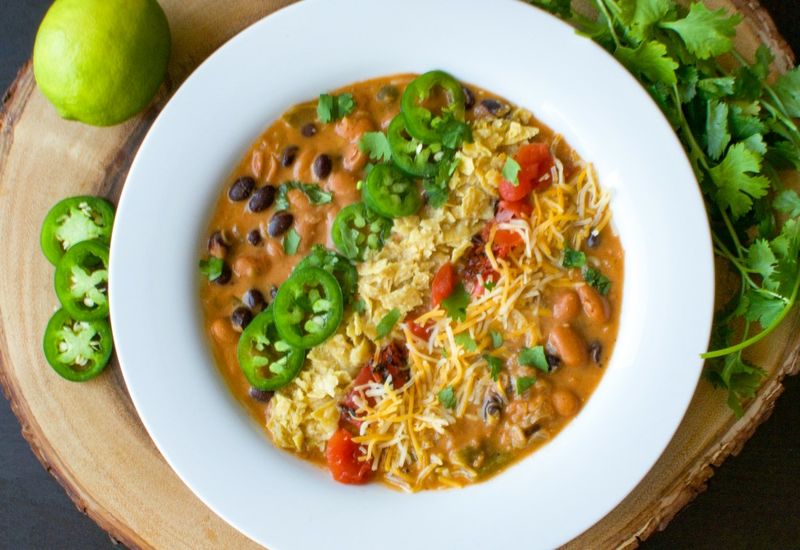 This tortilla soup recipe provides a simple and delicious weeknight dinner option. Hearty red lentils, black beans, and pinto beans cook in a creamy tomato base in your pressure cooker. Let everyone customize their own bowl with toppings like crushed tortilla chips, jalapeño peppers, shredded cheese, and diced tomatoes. Everything is ready to eat in under an hour. Pour vegetable broth and tomato sauce into the pot of your pressure cooker; add onion, jalapeño pepper, black beans, pinto beans, red lentils, salsa verde, garlic, paprika, cumin, chili powder, and cayenne pepper. Seal lid on pressure cooker, turn steam vent handle to Sealing, and select Soup. Cook on High Pressure for 20 minutes. Let pressure release naturally. Stir whipping cream through the soup; season with salt and pepper. Ladle soup into bowls and top with any desired additional toppings. To make this recipe vegan, replace heavy whipping cream with coconut cream. It will still make the final dish rich and creamy. Per Serving: 211 calories; 4g fat; 34.3g carbohydrates; 11g protein; 9mg cholesterol; 757mg sodium. I wasn't sure how this would taste, but it was so creamy and delicious. Everything I expected from tortilla soup, and more. The lentils really complement this dish nicely. I didn't miss the fact there was no meat in this recipe. The flavor was spot on, thanks to the spices. Definitely a favorite! This tortilla soup was so delicious! It tasted exactly like traditional tortilla soup and was extra creamy. The paprika and cumin spices were phenomenal! I topped mine with cheese and tortilla chips. It's seriously one of the best vegetarian soup recipes I've tried. I'm already thinking about making another batch. This was delicious! Even my carnivore husband liked it. I used Mrs. Renfro's like Hector did, it is what I had on hand. I loved the texture and served it with cheese, sour cream and baked tortilla strips. Okay, it's not "tacos," but I made this for Taco Tuesday anyhow. Actually, it is tacos. It's "deconstructed" tacos! Great flavor, but I attribute it to using Mrs. Renfro's green salsa, which isn't so much a traditional salsa verde as it is "hot fire stuff". Devoured the leftovers the next day & I normally HATE leftovers! Can’t say enough good things about this recipes. Follow it exactly how it’s made or add chicken if you’re not a vegetarian. It’s creamy, flavorful, and a one pot wonder for taco night (or any other night for that matter). Red lentils are kind of hard to find but definitely don’t try to sub it with something else. 5 stars for flavor. But after the 20 minute cook and near 24 minute slow vent time, the beans weren't done. Additional 10 minute cook (and 24 minute vent wait - still not done. Another 10 minute cook time (and wait) we were finally ready to eat. Would soaking the beans prior to cooking help? Another thing concerning the Mealthy (and others) - we were unaware of how long the pressure release takes. This is something that needs to be considered when planning meal serving time. Ours was over an hour late. I followed the recipe to the letter but the pinto beans were not cooked after 20 minutes. Tried another 10 but they are still hard. Granted I am new to the pressure cooker but I didn’t get the expected result.